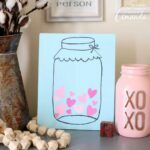 Mason Jar Valentine's Day Art: easy and cute Valentine's Day art! Make this Mason Jar Valentine’s Day art in minutes with the free printable template below. Add it to your home decor for a touch of love during the blah winter months. If you think you can’t paint your own art, try our technique below to make it oh so easy. I love decorating my home for Valentine’s Day with just a few simple touches! And of course, I love mason jars. 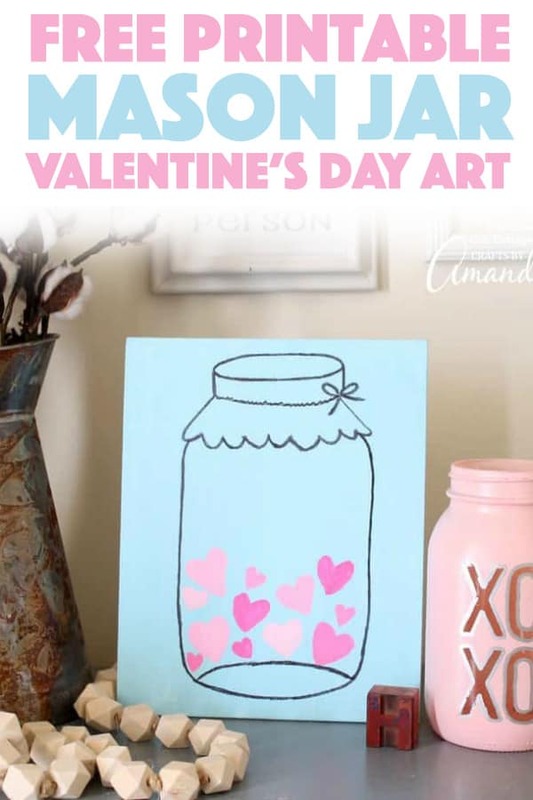 This Mason Jar Valentine’s Day art combines both of my loves into one 30 minute project that anyone can tackle. 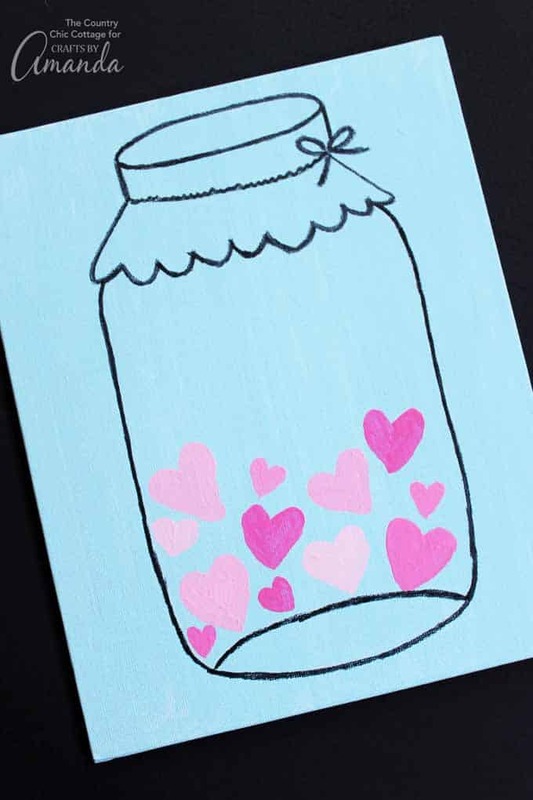 Related: Try making that pink mason jar vase pictured below with the instructions here or even some Valentine’s cookies. Start by painting your canvas with aqua paint. TIP: Don’t forget the edges for a finished look. 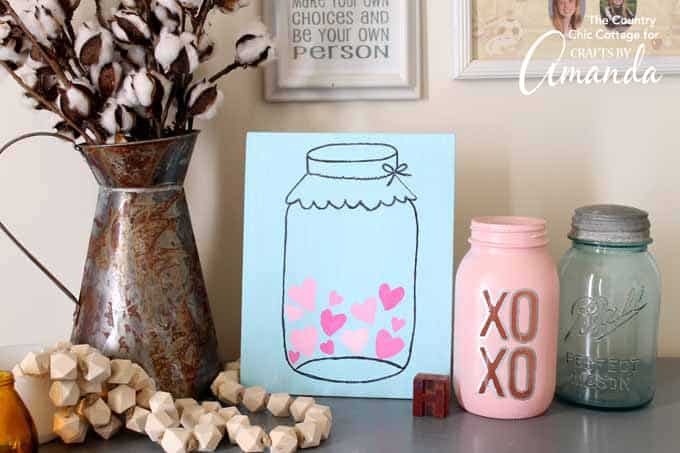 Print the mason jar art template by clicking here. Layer transfer paper and the printed template over the top of the canvas. TIP: Make sure the shiny side is down on your transfer paper. Go over all lines on the template with a pen, pushing hard to ensure transfer of lines to the canvas. TIP: You may find it easier to put a book under your canvas to have something to press against. Start by tracing the lines of the mason jar with a Sharpie. Then use the pink and white paint to fill in the heart shapes. Use a mixture of pink with white in various amounts to create the variety in the hearts. Allow everything to dry completely then add to any place in your home that needs some color. 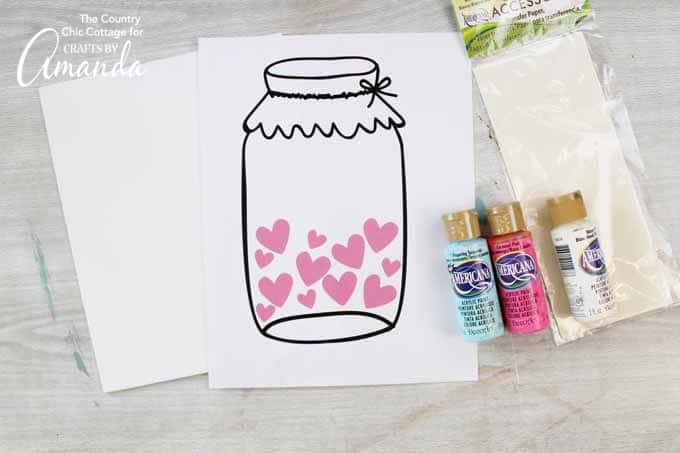 Grab your supplies and get started on this Mason Jar Valentine’s Day art or use the same technique to make art for other seasons. This project is so simple and makes turning any printed image into art simple. You will have handmade art all over your home! For more super cute Valentine’s Day crafts check out this How To Paint Wine Glasses (Valentine’s Day inspired) post! They make great gifts to friends or loved ones. Or maybe you’re skilled at crochet and you can make this sweet Valentine’s Day Heart Infinity Scarf, or for adding a little love to your home, this Valentine’s Day Wood Shim Wreath is super easy and inexpensive. If you’re looking for something you and the kids can do together, here’s a whole list of 25 Easy Homemade Valentine’s Day Cards to choose from! Start by painting your canvas with aqua paint. TIP: Don't forget the edges for a finished look. Go over all lines on the template with a pen pushing hard to ensure transfer of lines to canvas. TIP: You may find it easier to put a book under your canvas to have something to press against. This post was originally published on this blog on Jan 17, 2018. I am tossing around ideas for using mason jars for an upcoming bridal shower. Your Valentine’s craft is super cute. Pinned! what a great collection. I love mason jar art so right at the heart of the home. I love this idea it is simple yet so cute. I might do this for my hubby for valentines day! YAY so happy to find your lovely blog at inspire me monday today.